How to find MySQL data directory name? In this tutorial I will show you the various ways to find the data directory of a MySQL Server. There are various ways to find the data directory of MySQL server on Windows and Linux computers. You can follow any of the methods to find data directory of the MySQL server. We are discussing all these methods used for finding the data directory. Open the my.ini file and you will find the directory url where data is being stored. So, you should find the location of MySQL installation on your windows computer and there you should be able to find the my.in file. In my case it is in the "C:\Program Files\MySQL\MySQL Server 5.5" directory of Windows 7 computer. 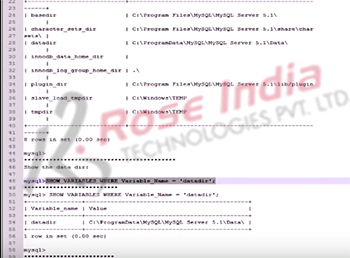 Here is the video tutorial of: "How to find MySQL data directory name?" 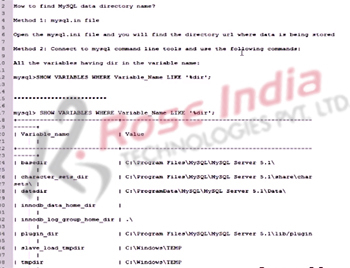 I this tutorial you learned how to find the data directory of MySQL server.